Once the initial divorce papers are filed in an uncontested divorce, most states require the papers to be served on the other spouse. This stage of the divorce process is called "Service of Process." Service of Process is an essential step in the commencement of an uncontested divorce because it establishes the court's jurisdiction over the parties, or the right for the court to hear and decide on matters of the divorce. However, some states have simple methods around service of process for uncontested divorce. With DivorceWriter, your uncontested divorce will utilize these methods, ensuring your divorce is done as simply as possible. Personal Service. Personal service means the filing spouse (Plaintiff/Petitioner) personally hand-delivers the initial divorce documents directly to the non-filing spouse. This is true in thirteen states. Six states require personal service by a person over the age of 18 who is not involved in the divorce case. Florida requires personal service by a private process server or the Sheriff's department. Connecticut requires personal service by a State Marshal. Substituted Service. a) Many states allow service simply by mailing the papers to the Defendant's actual address; certified mail, return receipt is generally required, but a few states do allow service by first-class mail. Note: Certified mail means that the Post Office gives you a slip that proves you mailed a letter. A "return receipt" is a green postcard that the Post Office attaches to the letter that the recipient must sign to show that he or she received the letter. The Post Office mails the green card back to the sender. Most times the court will require the return receipt to be either filed or brought to court for the divorce hearing. b) Rhode Island permits an adult not involved in the divorce case to serve the non-filing spouse by leaving the initial divorce documents with any person at the Defendant's home who is old enough to understand the responsibility of accepting service. In most states, when Service of Process is complete, a proof of service must be completed and filed with the court. It is the responsibility of the Petitioner to make sure that the proof of service is filed. Are there times when Service of Process is not required? When both spouses sign the Petition and file jointly, the court has jurisdiction over both parties and service of process is not necessary. In the states that allow the spouses to file jointly, DivorceWriter provides you with the Joint Petition and instructions for filing. 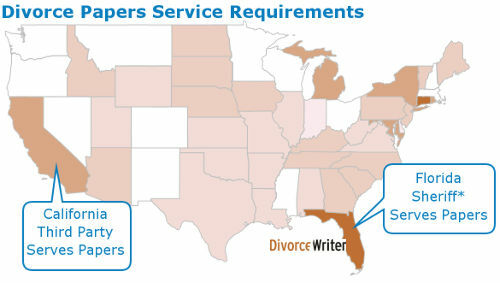 In these states, you don't have to serve your spouse. When the Defendant/Respondent waives Service of Process. Typically, the Defendant/Respondent signs a document called a Waiver and Acceptance of Service, which is filed with the court. In all states that allow the Defendant/Respondent to waive service, DivorceWriter includes all the forms and instructions so you don't have to worry about Service of Process. How can my spouse be personally served if he/she lives out of state? The process for serving a spouse that lives in another state depends on the state where the divorce is filed. In states that require personal service by a Sheriff or private process server, the filing spouse will need to make arrangements for service by the Sheriff in the county and state where the non-filing spouse lives or by a private process server in that state. When states require service to be made by an adult over the age of 18 who is not part of the divorce cases, service on a spouse living in a different state or foreign country must be made by a Sheriff or private process server as described above. When states allow service by first class or certified mail, service of process can be done this same manner, regardless if the spouse lives out of state. In some cases, the court will allow you to serve your spouse by publication, which means that notice of the filing of your petition will be published in a local newspaper or newspapers. Service by publication takes a little bit longer than the other methods of service, as there is a longer period of time that must past before a response by the Defendant/Respondent is due. If your spouse does not file the required response by the response due date, a default judgment can be entered. Arizona Personal service by hand-delivery or substituted service by mail. California Personal service by an adult over the age of 18 who is not a party to the divorce action, or in all counties but San Diego, substituted service by regular U.S. Mail. Note: This does not apply to Summary Dissolution of Marriage in California. District of Columbia Personal service by an adult who is not involved in the case, or substituted service by certified mail. Delaware Petitioner may have the family court deliver the documents to the Respondent, or the Respondent may pick them up at the court. Florida Personal service by a private process server or by the Sheriff's department. Note: This does not apply to Simplified Dissolution of Marriage in Florida. Georgia Personal service by hand-delivery or substituted service by mail. Iowa Personal service by hand-delivery or substituted service by mail. Idaho Personal service by hand-delivery or substituted service by mail. Indiana The Court Clerk will serve the non-filing spouse by certified mail. Kentucky Substituted service by mail. Maryland Personal service by an adult who is not involved in the case, or substitutes service by certified mail. Maine Personal service by hand-delivery or substituted service by mail. Michigan Personal service by an adult who is not involved in the case or substituted service by certified mail. North Carolina In all counties except Wake County, personal service by the Plaintiff. In Wake County, the Plaintiff must serve Defendant by certified mail. North Dakota Personal service by hand-delivery or substituted service by mail. Nebraska Personal service by hand-delivery or substituted service by mail. New Jersey Personal service by hand-delivery or substituted service by mail. New York Personal service by an adult who is not involved in the case. Pennsylvania Substituted service by certified mail. Rhode Island Personal service by someone who is 18 years of age or older (and who is not going to serve as a witness at the divorce hearing) to hand-deliver the documents OR by leaving a copy of the divorce documents at the Defendant's home with another person 18 years or older who resides there. South Carolina Personal service by hand-delivery or substituted service by certified mail. South Dakota Personal service by hand-delivery or substituted service by mail by first class mail. Tennessee Personal service by hand-delivery or substituted service by mail. Vermont Personal service by hand-delivery or substituted service by mail. Alaska The non-filing spouse waives service by signing an Appearance and Waiver of Notice of Hearing. Alabama The non-filing spouse waives service of process by signing an Answer, Waiver, and Agreement for Taking Testimony. Arkansas The non-filing spouse waives service by signing an Entry of Appearance Pro Se and Waiver of Service of Summons. California Service of Process is not required in California if you file for a Summary Dissolution of Marriage because both spouses will sign a Joint Petition. Colorado Service of Process is not required in Colorado when both spouses sign the Petition for Dissolution of Marriage. Florida Service of Process is not required in Florida if you file for a Simplified Dissolution of Marriage because both spouses will sign the Petition. Hawaii The non-filing spouse waives service by signing an Appearance and Waiver. Illinois The non-filing spouse waives service by signing an Entry of Appearance, Waiver and Consent. Kansas The non-filing spouse waives service by signing an Entry of Appearance. Louisiana The non-filing spouse waives service by signing an Acceptance of Service and Waiver of Citation and All Delays. Massachusetts Service of process is not required for uncontested divorces. Minnesota Service of process is not required for uncontested divorces where both spouses sign the Petition. Missouri The non-filing spouse waives service by signing an Entry of Appearance and Waiver. Mississippi Service of process is not required for uncontested divorces where both spouses sign the Joint Complaint for Divorce. Montana Service of process is not required for uncontested divorces where both spouses sign the Joint Petition. New Hampshire Service of process is not required for uncontested divorces where both spouses sign the Joint Petition. New Mexico Service of process is not required for uncontested divorces where both spouses sign the Petition. Nevada Service of process is not required for uncontested divorces where both spouses sign the Joint Petition. Ohio Service of process is not required for uncontested divorces where both spouses sign the Petition. Oklahoma The non-filing spouse waives service by signing a Waiver of Summons and Entry of Appearance. Oregon Service of process is not required for uncontested divorces where both spouses sign the Petition. Texas The non-filing spouse waives service by signing a Waiver of Citation. Utah The non-filing spouse waives service by signing an Acceptance of Service, Appearance, Consent and Waiver. Virginia The non-filing spouse waives service by signing an Acceptance/Wavier of Service of Process. Washington Service of process is not required for uncontested divorces where both spouses sign the Petition. Wisconsin Service of process is not required for uncontested divorces where both spouses sign the Joint Petition. West Virginia The non-filing spouse waives service by signing an Acceptance of Service. Wyoming The non-filing spouse waives service by signing an Acknowledgment and Acceptance of Service.